Non destructive evaluation of windmill blades using ultrasound is a challenging task. Microstructure of fiberglass and resin composites (GFRP) introduces dispersive effects on ultrasound waves, which is seen as grain noise and produces high attenuation to ultrasonic signals. The traditional approach to overcome these problems is using low frequency transducers (typically 500 kHz), at the expense of loosing resolution, and hence, the capability to detect small defects or to inspect low thickness components. A phased array with 128 elements, inter-element pitch of 0.5mm and 5 MHz was used, in contact with the flat surface of the inspected part (see Figure 1). A SITAU-311-PRT equipment was used, with 32 channels multiplexed to 128 array elements, and linear B-Scans at 0º were performed. The inspection goal is to detect broken fibers in a 3mm thickness layer of GFRP material. Shown images were obtained in field, from a real windmill blade, with a 500mm length cut in the inner glass-fiber layers. Figure 2 (right) shows three of the B-Scans acquired along the fiber cut. As the ultrasonic pulse is not able to individually resolve each one of the glass fibers, what is seen in the images is an interference pattern between the echoes received by all fibers in the fabric. Relative position between fibers changes in the damaged zone, and so that, interference pattern also changes. Presence of broken fibers does not necessary mean that received amplitude will decrease, because glass-fiber layers can become overlapped in the curing process. In that case, fiber damage cannot be detected by means of conventional amplitude C-Scan ( figure 2 left ). 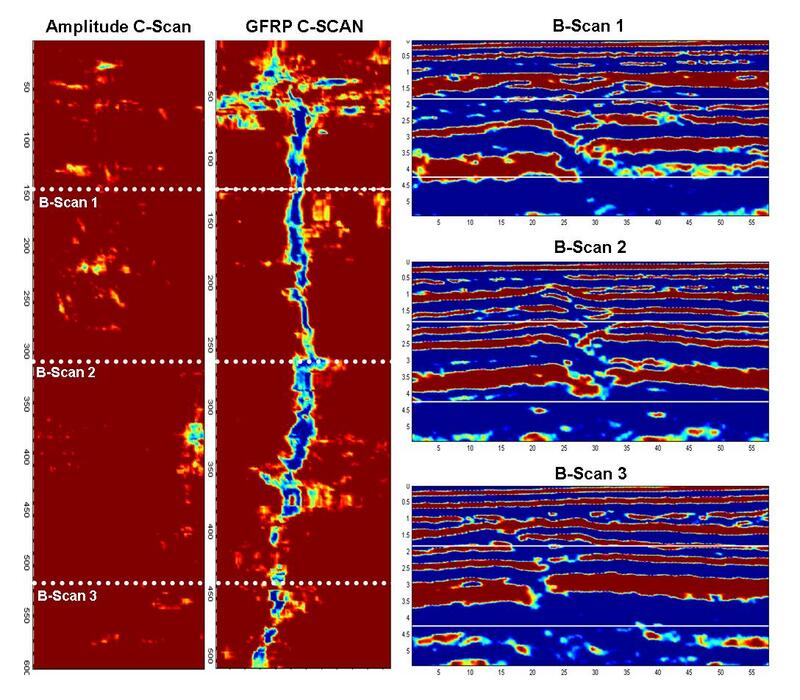 DASEL has developed a novel processing algorithm (GFRP-Scan®), based on the interference pattern analysis, that is capable to detect broken fibers also at very low thickness layers ( figure 2 center ). As signal processing is based on global information contained at each B-Scan, it is little sensitive to configuration parameters, and hence, a very robust evaluation method. (Rigth) Several B-Scans at different positions. Beam focusing capability of phased array systems allows using higher frequencies when inspecting GFRP components and so that, a much higher resolution can be achieved compared to traditional low frequency transducers. In this work, the feasibility of detecting broken glass fibers in a 3mm thickness GFRP layer was demonstrated. GFRP-Scan® algorithm, included in the ScanView® software and available for all SITAU models, allows detecting small defects in fiberglass layers with high reliability. Its effectiveness has been proved by the inspection (in field) of more than 50 blades before being installed in a wind farm.